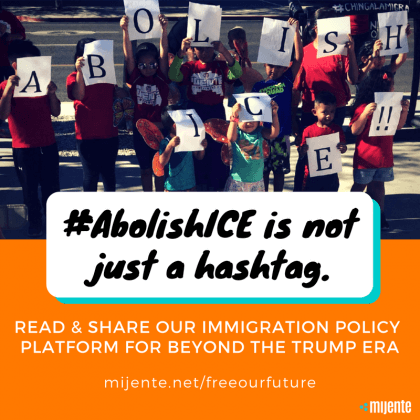 Today, Mijente, a national Latinx organization leading on mobilizing against immigration enforcement and criminalization, released a comprehensive immigration policy platform “Free Our Future” that calls for the abolition of Immigration and Customs Enforcement (ICE) and a full-scale decriminalization of immigration. Abolishing immigration and customs enforcement (ICE): Immigration and Customs Enforcement exists to target, imprison, and deport immigrants. Locking up and exiling people are their only reason for being. Immigration enforcement officers are now the largest federal police force. Their budget is more than that of all other federal law enforcement agencies combined. They are accountable to no one and take their marching orders directly from Trump. We need to defund ICE, and we need legislation that dismantles the agency. They have only been around for 15 years, and their continued existence is far from inevitable. There’s already movement: at least 21 Democratic congressional primary candidates have come out in favor of abolishing the agency. Trump’s deportation squad should cease to exist. Immigration enforcement as we know it must end. Repealing Laws Criminalizing Migration: The federal laws prohibiting “unlawful entry” and “unlawful reentry” are the legal weapon behind the heart-breaking separation of parents and children by the Trump administration. Under a new policy of “Zero-Tolerance,” Sessions’ Department of Justice is attempting to prosecute and imprison all migrants (including those with children) arrested after crossing the border–drastically ramping up the already-record breaking deportation efforts of the Obama administration. Even before “Zero Tolerance,” migrant prosecutions had already grown to be half of all federal prosecutions each year and resulted in a federal prison boom. Congress should immediately repeal 8 U.S.C. § 1325 and 8 U.S.C. § 1326, the laws that criminalize migration and punish immigrant families. Ending Operation Streamline: Operation Streamline is a federal strategy of mass hearings and mass imprisonment. The US government puts dozens of immigrants into a courtroom, shackled at their hands and ankles. Then, rather than giving them individualized hearings, the Department of Justice puts them through a mass procedure all at once, finding them all guilty and sentencing them for having crossed the border without permission, after which they are usually deported by ICE. Operation Streamline has criminalized migrant crossings in the southern United States on a mass scale already. Now the Trump administration has expanded it beyond limited cities in Arizona and Texas to include the entire southern borders of Arizona, Texas, and New Mexico. Officials in California have announced the beginning of mass prosecutions there as well, with Trump and Sessions planning to convict hundreds of immigrants per day. Ending Operation Streamline is essential to ending the criminalization of migration. Enacting non-cooperation policies at the state and local levels that go beyond Sanctuary laws: While the immigration police force might dwarf all other federal police forces in size and budget, they still require the cooperation not only of private industry actors but of state and local authorities to carry out their agenda of detention and deportation. States and localities vary in their willingness to partner with ICE, but even places that have declared themselves “sanctuaries” continue to facilitate ICE’s violence. The fights to kick ICE out of our communities have been going on since the agency’s inception, and now, more than ever, we must hold our towns, cities, and states accountable for abetting Trump’s racist agenda. Sanctuary and non-cooperation policies must be more than symbolic. They must actually prevent data-sharing, stop the rental of county jail to ICE for immigration detention, and eliminate all other enforcement support provided to ICE by our state and local governments. “Our vision will continue to evolve in the months and years to come, but we remain grounded in a commitment to free our future from the Trump regime,” stated Angelica Chazaro, Mijente member and one of the authors of the report. Mijente is a national Latinx organization leading on mobilizing against immigration enforcement and criminalization. As a digital and grassroots hub for Latinx and Chicanx movement building and organizing, Mijente seeks to increase the profile of policy issues that matter to our communities and increase the participation of Latinx and Chicanx people in the broader movements for racial, economic, climate and gender justice.